This beautiful, reverent, affectionate and historically accurate Japanese movie almost slipped me by – not as connected as I once was to news from the world of anime, I heard about it only because it was on the plane during my trip back to England. And I’m very glad I caught it, because it was superb. Crowdfunded, helmed by a director I’ve never heard of (though I’ve seen other works he’s been affiliated with) and produced by Studio Mappa who thus far are mostly known for the far less serious Yuri on Ice, this is perhaps an unlikely hit, but it hits all the right notes. 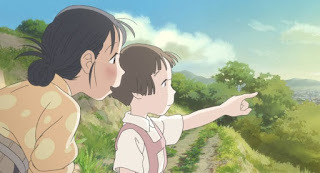 It treads similar ground to Grave of the Fireflies and will of course be compared with it in just about every review, but has a far less focused and relentless tone, instead giving a far lighter touch and a whimsical method of building up its characters that actually reminded me of French filmmaking. Based on a manga, this film tells the story of Suzu, a simple and rather childlike young woman who comes from a small community on the outskirts of Hiroshima. In the years before the war, she gets married to a young man she met only once before and doesn’t remember, then goes to live in nearby Kure, a naval port. There, she contends with being a bit hapless in a new community away from her family. Her new husband has a sick mother, a big house and a domineering older sister to contend with, and her attempts to please them and do her best are very endearing – though she’s scatterbrained and has a habit of tilting her head when she forgets things. Of course, eventually the war comes and brings with it at first inconvenience, and later tragedy. Naive Suzu retains her gentle nature through personal injury, large-scale tragedy and the unfamiliar aspects of life in a military town, like when she’s tempted by an extramarital affair or when she first encounters prostitutes. The things she must endure are pretty horrific, but her reaction is believable – neither breakdown nor numbness, but a mixture of sorrow, guilt at not being able to do more to help others, and of course retaining her underlying personality really give this piece a believable and deeply likeable centre. The things she has to endure are terrible, as one would expect from a wartime drama, but there’s a rare subtlety in how they affect her, here. The film is also beautiful. Suzu’s talent is for art – one of the funniest moments in the film comes when the military police suspect her of espionage and her feelings are hurt when everyone else finds the very idea hilarious – and sometimes that gets reflected by the artistic choices of the movie. The images of rabbits in the surf and the silly stories of childhood coming to life provide beauty or levity that enhance the artistry of this film. Of course, it’s a heavy movie, but the point is to focus on war’s affect on ordinary people. Suzu knows nothing of Hitler or Manchukuo, is a product of her society with next to nothing to gain from Japan’s military role in the war, and is far more concerned with living as well as she possibly can. This isn’t a grand political statement, it’s an effort to capture the reality of a time and place that was to be shattered by the Bomb. Delicate, nuanced and well-researched, it’s a must-see for anyone looking for art-house anime.